After 18 years of 80 hour weeks in the kitchen, Chef Geoff Lazlo needed a break. It’s what kids call “a gap year,” a sabbatical before taking on the next challenge in their lives. For Lazlo that time off would offer a chance to relax with his family, reassess his options, and realize his dreams. Let’s start there, with the first of his fantasies. Though he had worked with the likes of Alice Waters at Chez Panisse, Michael Anthony at Gramercy Tavern, Dan Barber at Stone Barns, and Bill Taibe at The Whelk, as well as running his own award-winning restaurant, the acclaimed Mill Street Bar and Table in Greenwich, Lazlo had always dreamed of cooking an elaborate feast at the James Beard House in New York City. 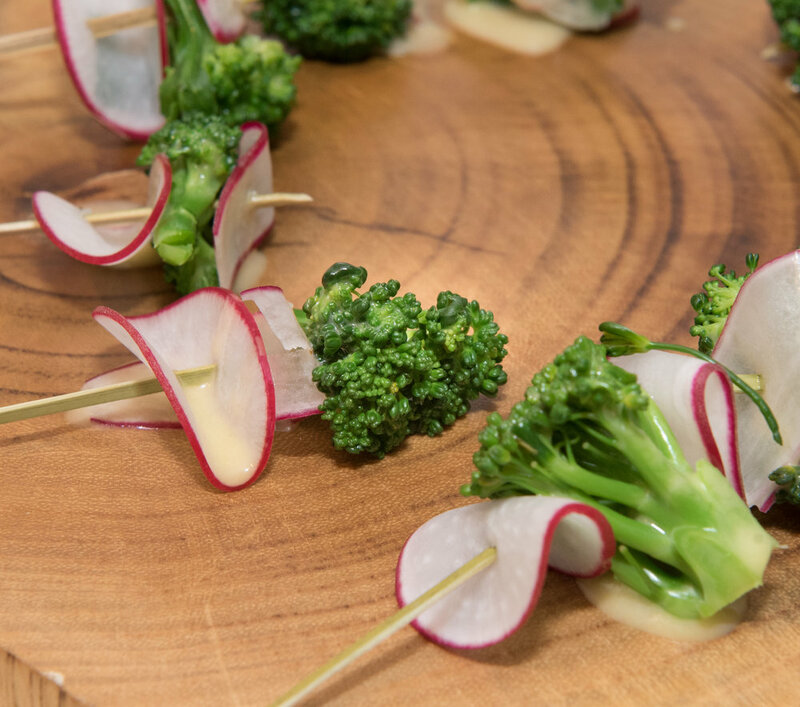 Each year, this esteemed culinary epi-center hosts dinners prepared by select world class chefs, who are invited to create tasting menus that show off their gastronomic chops to the foundation’s members and guests. For Geoff, working in Beard’s kitchen would be like taking the mound at Yankee Stadium. He recently he got his start, and by all accounts Chef Lazlo threw a perfect game to a sold out room. 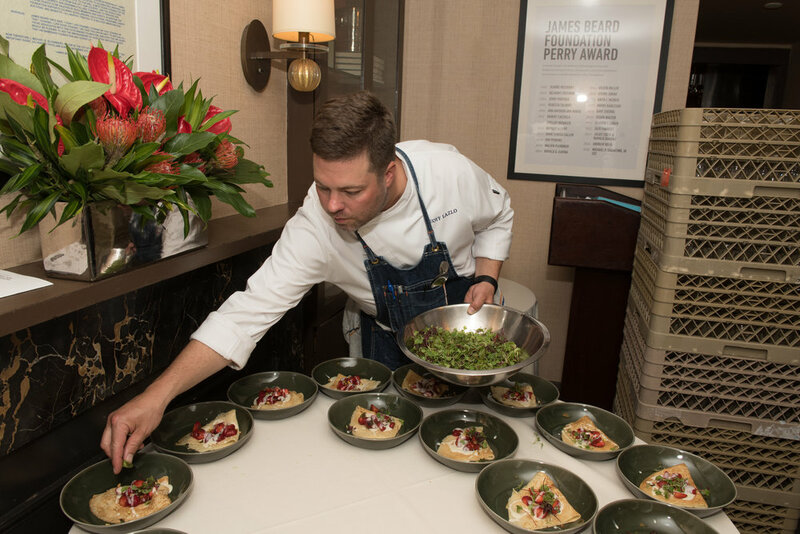 His concept, “A Connecticut Farm Feast,” perfectly captured his focus on fresh seasonal ingredients sourced from local purveyors who are committed to sustainable and organic foods. He also asked his teacher, mentor and friend, renowned wine guru Phillipe Newlin to serve as the dinner’s sommelier. Lazlo also invited long time colleagues to work with him in the kitchen. “We had an all-star lineup,” he told us, delighted to pencil in cherished associates to his lineup. The morning of the feast, Geoff shopped at the Westport Farmer’s Market, ensuring the meal’s seasonal freshness. 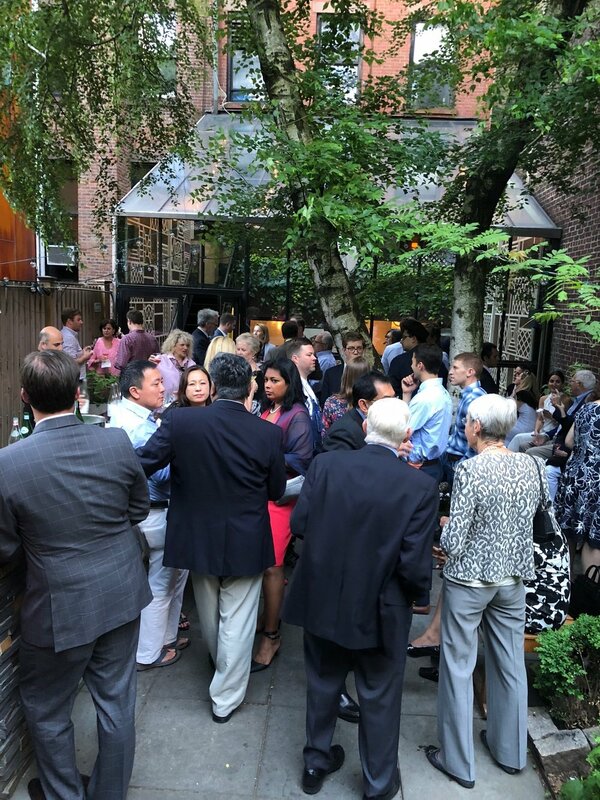 After Hors d'oeuvres were served al fresco in the Garden, Lazlo began the dining room menu with a Stonington Scallop Crudo, served with pickled ramps and seaweed. “I like to start with something raw,” he told us, “It’s light, it’s bright, and it’s not too filling.” Clean, cold and simple, the Connecticut scallops also afforded a good starting point for subsequent courses that would build in intensity and complexity. In contrast to the chilly Crudo, Lazlo next served a sunny pasta course: homemade Ricotta Cavatelli, accompanied by a soft warm farm Egg which was complimented by English Peas and Pancetta Pecorino. If the first course spoke of the sea, this one, especially the warm egg, waved “country” and “farmland.” Familiar, nutritious, comforting. A classic flavor profile. The third course upped the ante: “Salt roasted” Long Island Striper, pulled from our local waters. “I wanted an ‘earthy’ as well as ‘briney’ experience,” Lazlo told us. 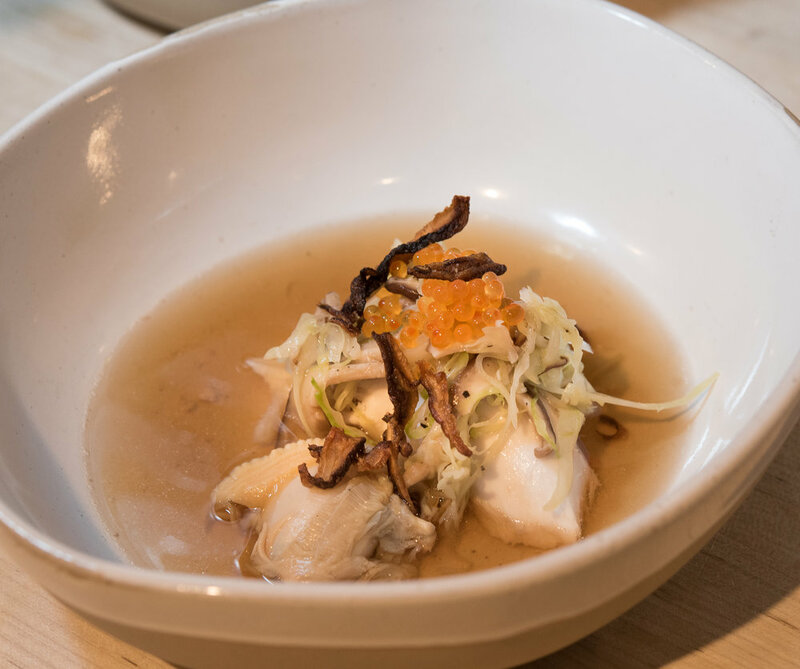 To achieve that flavor canvas for the fish, he added a Mushroom Broth and Cabbage to counterpoint Little Neck clams and trout caviar. Bass may have been chosen for its familiarity, but the presentation was totally exotic. Lazlo added water to the salt, creating a “sand” that he wrapped around the whole striper, which he then baked. The heat hardened the salty slush, achieving a shell that virtually steamed the bass. Guests then had to crack the covering to get at the moist, perfectly cooked fish, which they then placed in the Shitaki sauce and finely julienned Cabbage. A dazzling, fun and very dramatic presentation. Contributing to the theatrics, Sommelier Newlin challenged diners by pairing the fish with both a Chablis and Pinot Noir. Many guests were surprised, if not astonished, that the red Pinot and the meaty Bass perfectly complimented each other, adding to the chatter in the room, and putting to rest the “white with fish, red with meat” cliché. The first three courses served as gradual builds, leading to the culmination of the feast: slow roasted Lamb Shoulder, rubbed with a seductive Middle Eastern spice, a crowd favorite at Mill Street. The meat, (sourced from Fleishers Craft Butchers in Connecticut) was sous vided for 15 hours at a very low temperature, allowing the lamb to retain its moisture and structure. Lazlo finished it on a grill to add char and smoke. For all the elegance of the room, the Connecticut chef was actually riffing on an scene straight out of his imagination: a dream in which he saw himself as an Egyptian street vendor, grilling the lamb on a charcoal burner in his cart, stuffing the savory meat into Pita his wife cooked that morning, mixing in fresh spicy Yogurt and garden cucumbers, which she pickled a few days before. 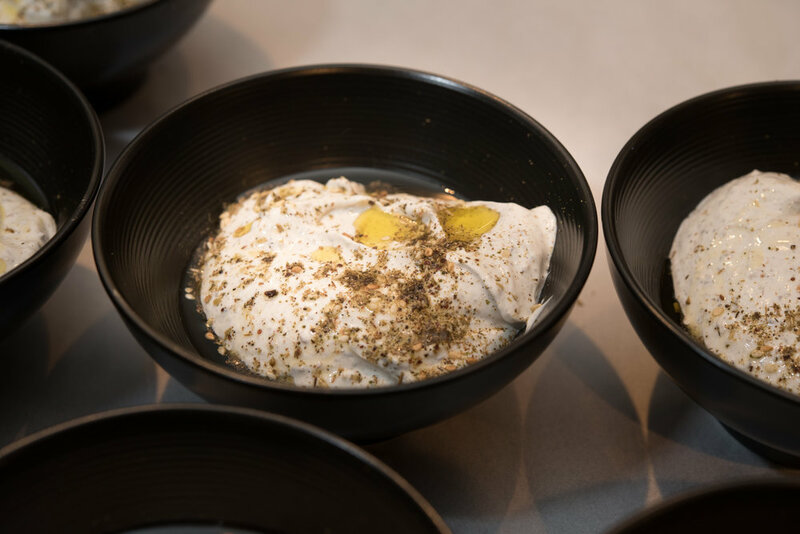 With tastes of a Connecticut farm and waters, the Italian countryside and a Cairo street, the sumptuous feast told a compelling story, a narrative that was a rousing hit with the James Beard crowd. One member of the Foundation told Lazlo that was the best meal she had at the House in 24 years. For Geoff, one dream had come true. Another of his dreams is to extend his brand, in the manner of his onetime mentor, Danny Myer, who expanded his empire from the elite Union Square Cafe to everyman’s burger joint, Shake Shack. When he first left Mill Street to explore his options, Geoff discovered the separation from a grueling day-in day-out kitchen gave him time to relax with his wife and 6 year old son. Though he treasured that break, many of his fans and customers asked him to create bespoke dinners and parties in his spare time. A catering business soon ensued: Geoff Lazlo Foods. Lazlo has also been invited to create Farm to Table dinners at many venues, including Millstone Farms, where his opulent Summer Soirees sell out in hours. Check www.facebook.com/geoff.lazlo for future dates. James Beard, author, actor, television personality, cook, critic, caterer, epicure, and consummate dreamer, a man of many recipes of himself, would doubtless approve.